Damifino Oil Candle - TT211 [TT211] : No Skew Turns, Gifts handcrafted from the world's beautiful woods. 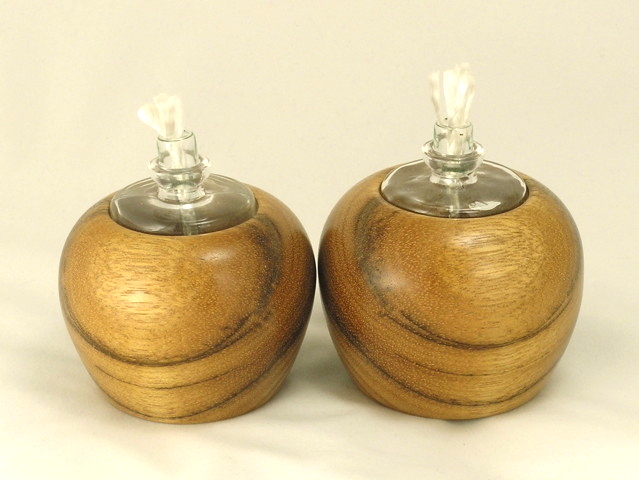 These small oil candles are turned from "Damifino" - that ubiquitous species found in every woodturner's stash. This particular example is from a salvaged Indonesian construction timber. More than that I cannot say. NOTE: These differ slightly in size so they are being sold individually. TT211 is the larger one on the right. Please fill the jar carefully, and wipe off any spilled oil before attempting to light the wick. Keep the exposed wick as short as possible to avoid smoking. Place candle on a non-flammable surface. Remember, NEVER leave any oil candle burning unattended!